This Wedding Cupcake Buttercream recipe has been featured in an extensive how-to post on The Recipe Girl blog: How to Make Wedding Cupcakes. 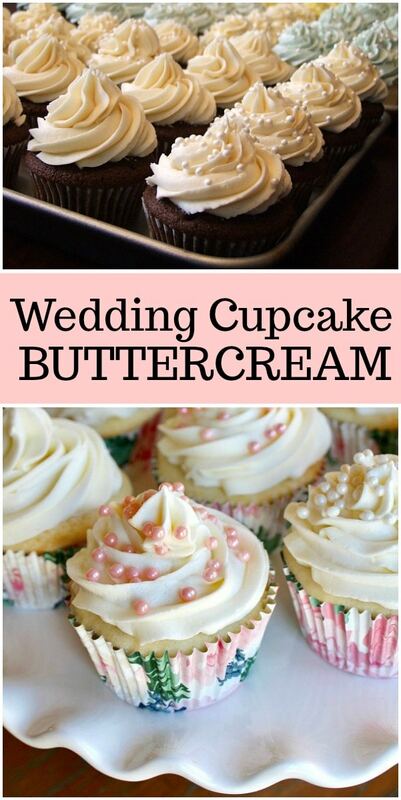 Watch the video showing you how to make Wedding Cupcake Buttercream, then scroll to the bottom of this post and print out the recipe to make it at home! This Wedding Cupcake Buttercream recipe was first featured here on RecipeGirl many years ago when I baked cupcakes for my son’s kindergarten teacher’s wedding. She wanted cupcakes and had heard that I might be able to do them for her. I worked for a catering company in college, but this was a little outside my comfort zone and expertise! 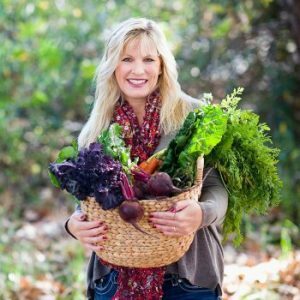 She loved my blog, and she begged me to help. How could I resist? I ended up taking on the project, and it was so much fun. Her wedding wasn’t terribly big, but I was tasked with making about 125 cupcakes. My kitchen was covered in cupcakes! It was a lot of work, but it was terribly satisfying to know that I was helping out this sweet teacher. The wedding cupcakes were a huge hit at her wedding, and everyone specifically noted how much they loved the frosting. This is the frosting recipe! 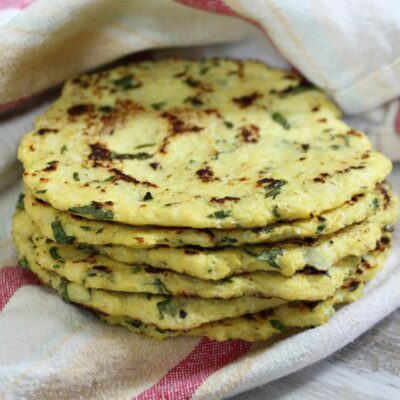 It’s so delicious, and it’s now a big-time favorite for a lot of people. If you have questions about this icing and wedding cupcakes… it may be helpful to read through the comments/questions/answers below the recipe- many of your questions may be answered there! Also visit this post: How to Make Wedding Cupcakes for all of the details on when to make the cupcakes and how to store and transport them to the wedding. 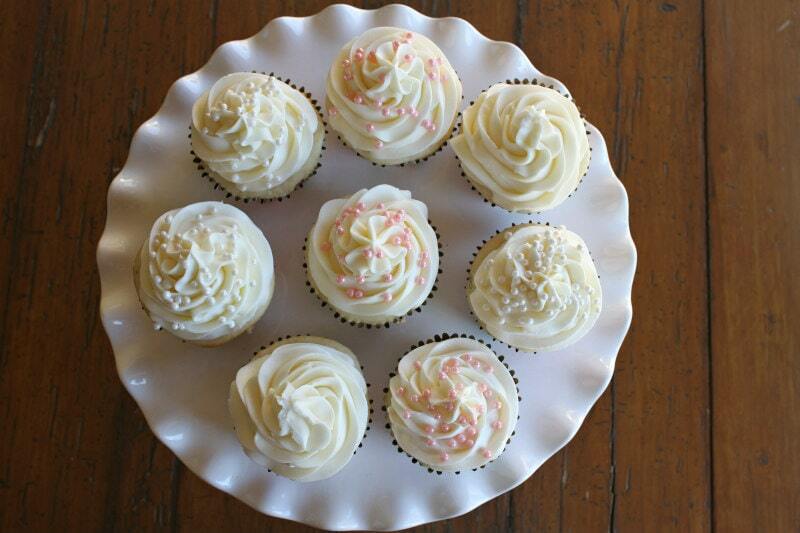 This Wedding Cupcake Buttercream is my go-to recipe for icing basic cupcakes and wedding cake. Every time I share the recipe on Facebook, I hear from other people who say it’s their go-to recipe too. It turns out perfect every time. It’s so easy to make, and it works through a piping bag well. The recipe will frost 12 cupcakes with a generous swirl. 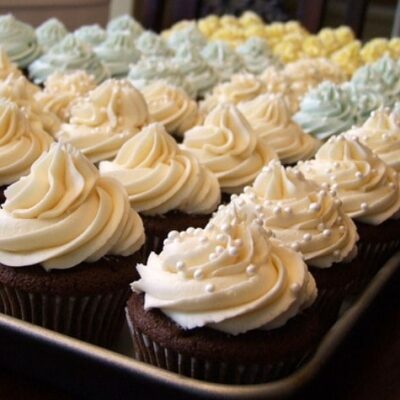 Double, triple, or quadruple the recipe to frost more cupcakes! Note that this recipe also works wonderfully for layer cakes. It spreads on smoothly, and you can pipe on decorations too. I use it for everything. It has been my go-to frosting recipe for so many years! A simple swirl on cupcakes creates a beautiful dessert for weddings with little candy pearls sprinkled on top. 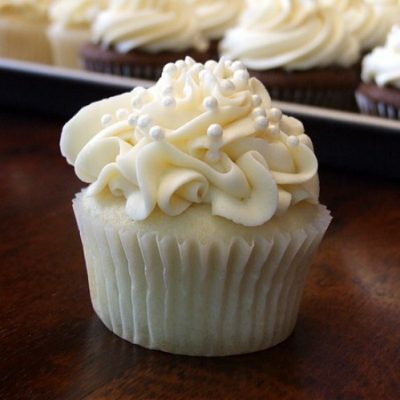 This Wedding Cupcake Buttercream is a very popular buttercream recipe- made by thousands who sing this recipe’s praises. I have used this very recipe for all of my cupcakes for so many years now. It’s a keeper recipe! It does work beautifully for weddings, but it’s not limited to just weddings! This buttercream is a nice one to use for all sorts of occasions. I call it Wedding Cupcake Buttercream because of my original story in using for the first time for the wedding. There are a few questions that people tend to ask related to this recipe, so I’ll go ahead and address them here. I like to use salted butter for just about everything, but I definitely use salted butter for this recipe. The salt will tend to cut down on the sweetness a bit. That’s a good thing! How far in advance should I frost the cupcakes? And should I refrigerate them? When I make these, I like to frost them the same day if at all possible. If you’d like to frost them the night before, that’s ok too. After adding the frosting, I like to put them in cupcake boxes and refrigerate them until they are ready to serve (overnight is fine). Once you put them out on display, they will defrost nicely and taste just as good as if you’ve made them the same day. 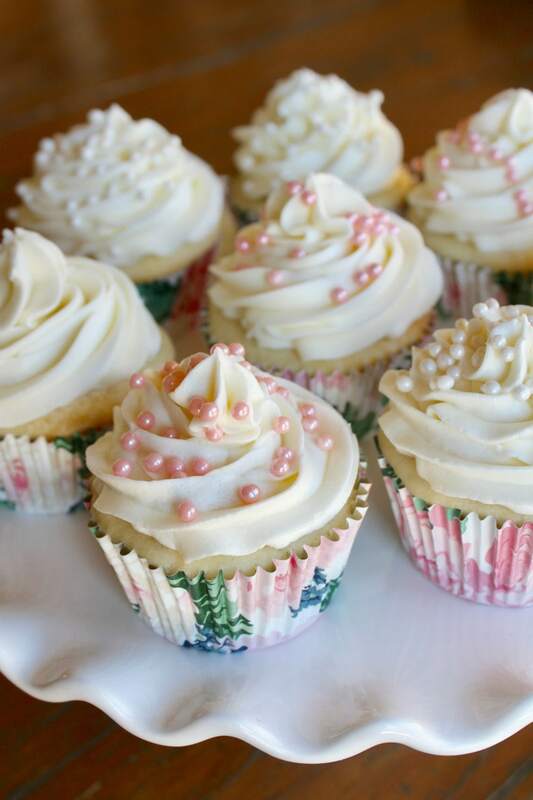 What should I do with leftover Wedding Cupcakes? 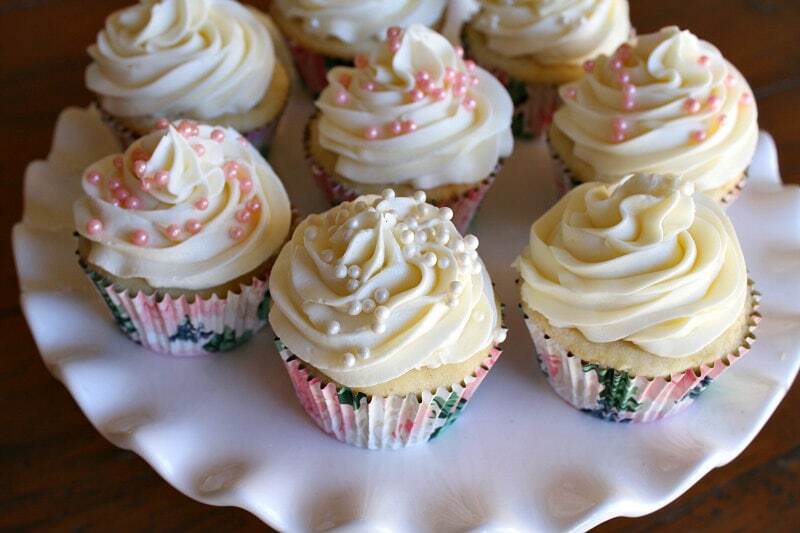 Keep leftover cupcakes in a covered container in your refrigerator for a few days. I’ve also frozen them in a covered container and they thaw nicely and taste pretty good that way too! If you’re looking for more frosting recipes you might also enjoy my Creamy Peanut Butter Frosting or Cookies and Cream Frosting. 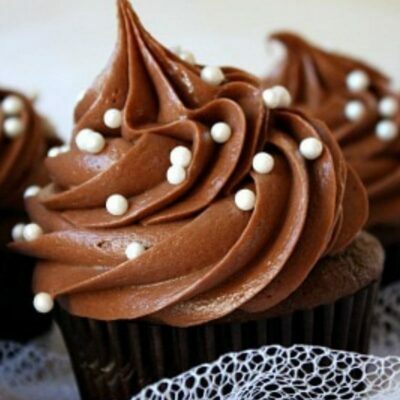 My Chocolate Buttercream Frosting is another favorite for topping wedding cupcakes. Swiss Meringue Buttercream is a beauty as well. Scoop into a piping bag and pipe decoratively onto cupcakes, or spread onto cupcakes as desired. *There is no need to sift the powdered sugar, unless you're worried that your sugar is quite lumpy. *Do not try to replace the butter with margarine or shortening- it won't work out well. *Add in color, if desired. I like to use colored gel paste instead of liquid food coloring- then you're not messing with adding additional liquid to the perfect consistency of the frosting. Gel paste is sold at craft stores and baking supply shops. For the cupcakes in the photograph above, I used a 1G Tip by Bakery Crafts to pipe the frosting. The Wilton 1M tip works perfectly for these too. 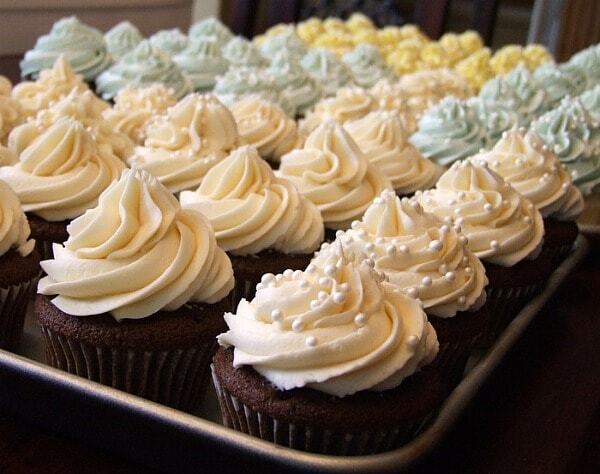 These cupcakes and buttercream frosting are the BEST! I had several in the family try them as we are planning a wedding shower, turned out beautiful and best of all delicious! Easy to make and much better than paying $3 or more per cupcake. I think they are better than what I have bought from cupcake specialty places. I can’t wait to try this recipe! Before I do, can you tell me if is there a particular brand of salted butter you use for this recipe? Do you have a go to cream cheese buttercream that is good for decorating? Can this buttercream icing be use to make a rustic look on a cake? I’m not really familiar with what a “rustic look” is like… so I’m afraid I can’t help! I want to frost but not fill a 9” 2 layer cake. How many recipes of frosting will I need to make? You can give your 2-layer cake a thin, base layer of frosting with one batch of this recipe. If you want to do any decor on the cake, you should double the recipe. Can I add a preserve to create a fruit flavored frosting? What will it do to the consistency? This was a good, easy recipe, however I found the frosting to be a bit too sweet. Adding extra vanilla tones the sweetness down. I initially put about 1.5 tsp of vanilla and it was too sweet, I added more vanilla (sorry, didn’t measure, just poured straight from the bottle) and that helped. Please How much butter use in grams? Google tells me that 1 cup of butter is 227 grams. Can this icing be done sugar free? I haven’t tried making it sugar free. Do you use salted or unslted butter ? I like to use salted. Looks very beautiful and great tips. 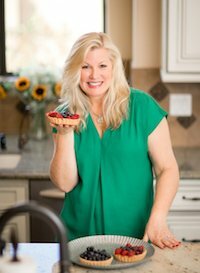 Seriously one of my favorite Recipe Girl recipes, love it! Love how easy this buttercream is to make, and so delicious too! This buttercream is unreal! So gorgeous for any cupcakes! 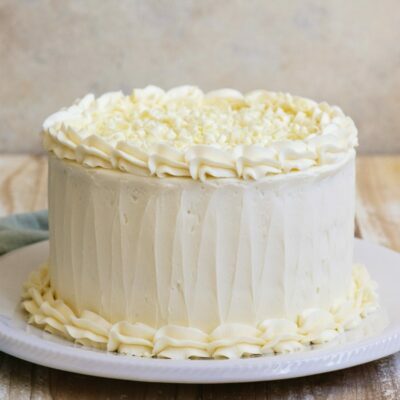 I love this buttercream recipe! I’m using it for the cupcakes I’m baking tonight. How much frosting does one batch of this recipe make? Enough to frost 12 cupcakes.